This page is about the aircraft F4U-1A. For other uses, see F4U (Family). The F4U-1A Corsair is a Rank II American naval fighter with a battle rating of 2.7 (AB/RB) and 3.3 (SB). It was in the game since the start of the Open Beta Test prior to Update 1.27. 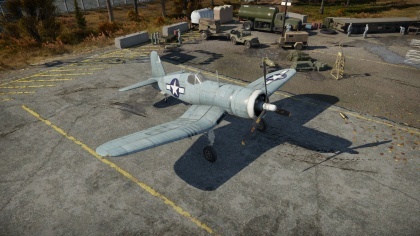 This is the first plane you will be able to use in the legendary Corsair line, and it will give you a good taste of what's to come. Sporting a very distinctive silhouette due to its inverted gull wings, it's never hard to pick a Corsair out of a crowd. However, the inverted gull wings are a double-edged sword, as it enables the Corsair to turn well at high speeds and have a good roll rate, but makes it turn mediocrely at low speeds. While not as powerful as its later siblings, the Pratt & Whitney R-2800-8W 18-cylinder radial can still propel the Corsair to a respectable 646 kph at around 6,800 meters. 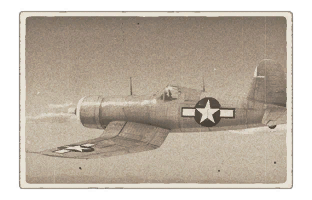 The Corsair also has a weak airframe that is very susceptible to incendiary rounds, so make sure to use your roll rate and good high speed performance in order to survive. The Corsair should be used as a medium-to-high altitude Boom & Zoomer, as flying at these altitudes is where the R-2800-8W radial makes the most power. It is very important to keep your speed up, as the Corsair hemorrhages energy at lower speeds. When fighting a F4U-1 in the air, any smart Corsair pilot will use their high speed and good high altitude performance to Boom & Zoom you, and will use their solid roll rate to avoid shots if they miss their first pass. However, you can force them to overshoot by using various defensive maneuvers and challenge for a shot on target due to the weak airframe of the Corsair. When flying a F4U, you should use Boom-n-Zoom tactics. This means that you should climb immediately and then dive on lower flying aircraft, then use your speed and momentum from the dive to climb. The Corsair does turn well, but loses energy and speed rapidly, so avoid turn fights or flat maneuvers. This plane is a very successful ground attacker when utilizing the ground belt ammunition against light pillboxes, un-armoured targets and some tanks. It is important to remember that this planes biggest asset is its energy retention, don't hang around near the ground or you will become a slow, heavy and easy target. If, while flying a Corsair, a plane with a decent pilot gets to your tail you probably wont be able to out maneuver it, but this goes both ways. If you encounter a F4U that is at low altitude or wasting its energy turn fighting, work your way behind it for a reasonably easy target to shoot down. These planes also seem to be highly flammable, so watch out for incendiaries or ... load up with API rounds yourself and go hunting. The one plane that should concern any Corsair pilot is the Messerschmitts 109s. They are very dangerous foes to anyone who fights by their rules. You will commonly encounter E-4's and F-1's, but you will occasionally come across the rare F-4 when being up-tiered. The E-4's aren't the most threatening as you can outspeed them by a large margin, but they can still shred you apart easily with their twin MG FF/M's. However, the F-1 is a very powerful foe. The first in the Friedrich line climbs better, turns better, and is fast enough to keep up with you, while still sporting a single MG FF/M mounted in the nose. Seek teammate's support if one tries to force an engagement on you. In the first tier of unlocks, there is nothing of interest in the performance department. Offensive 12.7 mm should be researched first to get rid of the lacking stock ammo. Starting from tier 2, all performance unlocks become necessary and useful. As a fighter the Corsair does rarely need bombs, research them last. Great top speed for its rank. Powerful armament with high ammo count. Can mount bombs for use against ground targets. Decently strong; can take a few hits. Relatively lethal armament against planes. Turn time isn't very good; try to avoid turning fights. View to the rear is somewhat obstructed; be wary of this in SB. Big target, easy to hit. Climb rate is a huge downgrade from the F4F-3 and F4F-4 when stock. Can be easily taken out by other players from behind. The F4U Corsair was designed by Chance Vought as a response to a request by the U.S. Navy Bureau of Aeronautics in February 1938 for twin and single engined fighters. The single engined fighters would need to reach the maximum obtainable speed, have a stall speed of no more than 70 mph and a range of 1,000 miles. The fighter also had to carry 4 guns, or 3 with increased ammo capacity, and had to be able to carry bombs. In June of the same year, the U.S navy signed a contract with Vought for a prototype, designated "XF4U-1" and after a mock-up inspection, the prototype was to be powered by an extremely powerful Twin row, 18 cylinder engine created by Pratt & Whitney designated as the "Double wasp". Reports from Europe indicated that two .30 cal machine guns and two .50 cal HMG's proved inefficient, and as a result, the U.S. Navy issued a new production proposal requesting heavier armament. Vought responded to this request by added 3 Browning .50 cal AN/M2 machine guns with 400 rounds per gun in each wing.